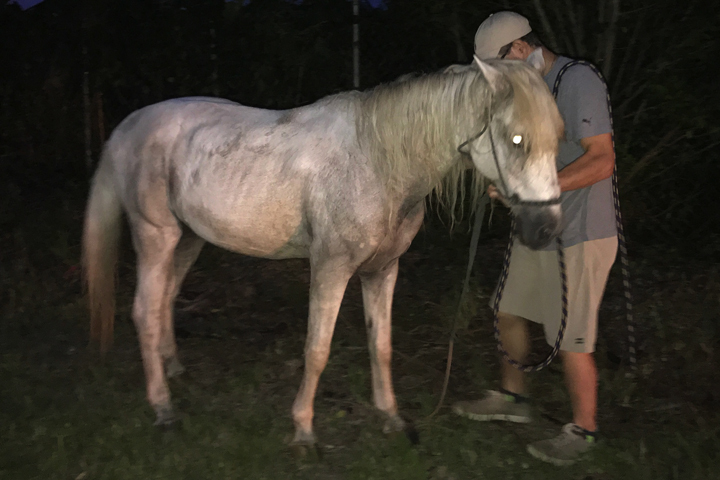 (SEPTEMBER 9, 2017 – HOMESTEAD, FL) Disaster plans and standard operating procedures exist at South Florida SPCA Horse Rescue, but Hurricane Irma will likely rewrite them. 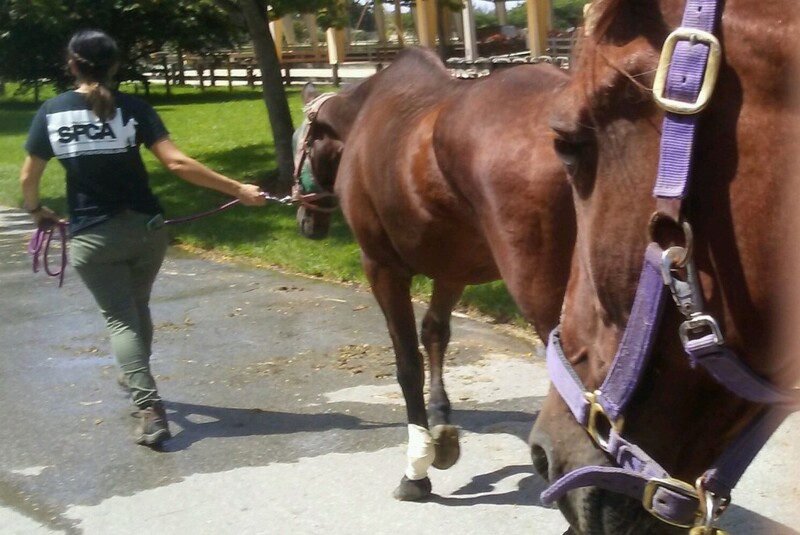 Faced with a ferocious Category 5 hurricane with sustained winds of 185 mph barreling toward its rescue ranch in Homestead, SFSPCA staff and board members had to scramble to get its herd of 57 formerly abused and abandoned horses moved to the most secure locations possible. Reservations made with local facilities and transport companies fell through and/or were given away to others, so Plan A gave way to Plans B, C, D, E, and ultimately “F” for its final solution. 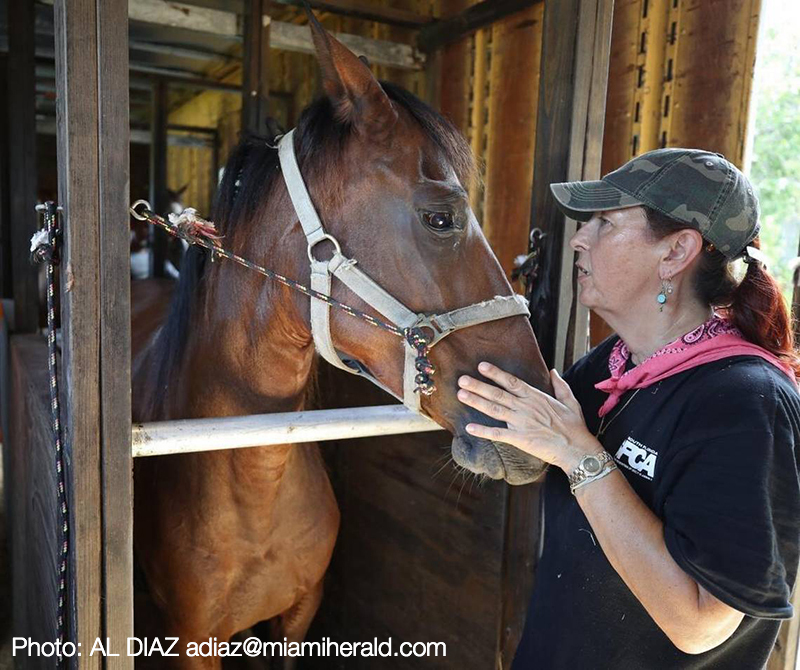 “There was absolutely no way we were going to fail our horses, who have already suffered enough at the hands of humans,” said South Florida SPCA president Kathleen Monahan. “As soon as we learned that despite our advance planning we had to find stalls and transport elsewhere, we all dove in. Appeals on social media and literally hundreds of calls were made. After many desperate hours, it was looking hopeless at times,” confessed Monahan. Friends of SFSPCA, old and new, miraculously stepped up with the right combination of lodging and transportation. All of the SFSPCA horses and ponies are now settled into five locations. The majority, 38 including young foals, were vanned over 300 miles in three separate loads north to Ocala. Lisa Oppenheimer, SFSPCA director of ranch operations and Key Largo resident, evacuated with them and will oversee their care until it is safe to return. PHOTO ABOVE: Suki, a young paint filly reluctantly boarding Hurricane Irma evacuation transport. VIDEO: Miami Herald video of evacuation of horses from Homestead, Florida. 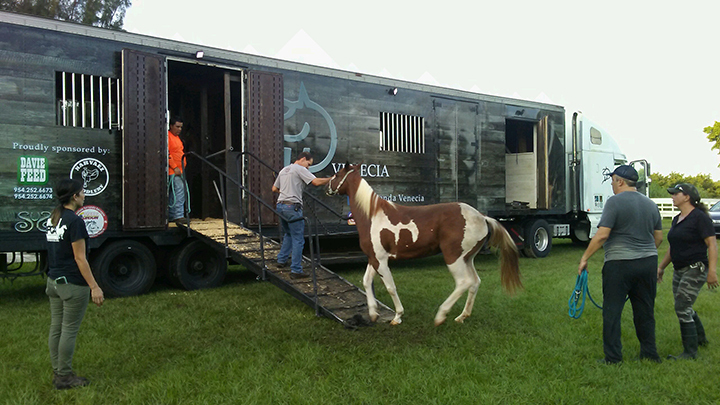 The remaining 19 of the 57 SFSPCA horses are sheltered at four different locations in South Florida, three of which are staying put at SFSPCA’s ranch. 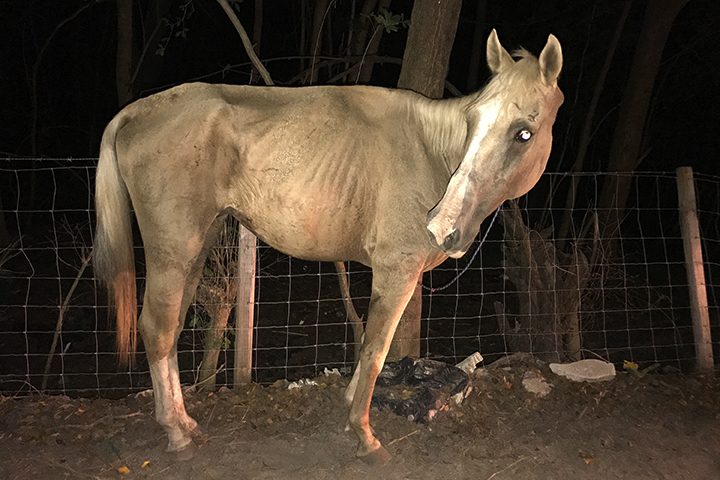 One was too frail to make the trip, and the other two were abandoned horses saved amid storm preparations on two separate nighttime rescues by SFSPCA founder and director of rescue operations Laurie Waggoner, along with a staff member and a volunteer on Thursday. Abandoned elderly pony rescued by SFSPCA on Thursday, September 7, 2017. Abandoned, emaciated horse rescued by SFSPCA on Thursday, September 7, 2017. 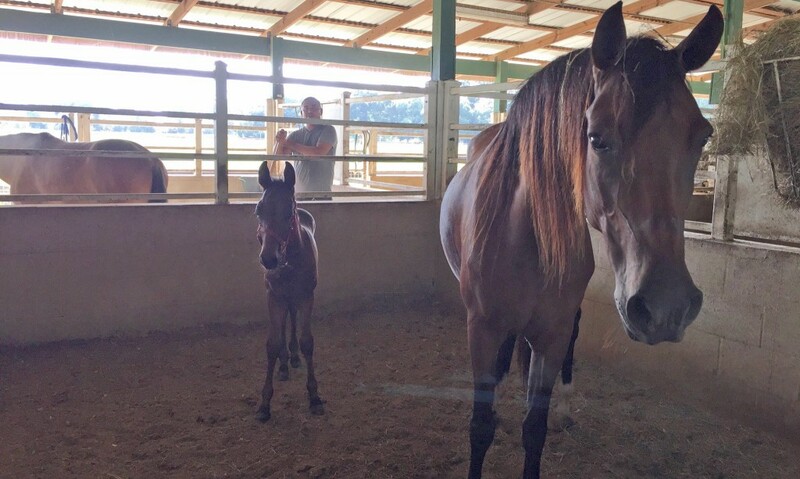 PHOTO ABOVE: New mom Penny with her young foal Biscuit Boy II settled into their stall in Ocala, FL. PHOTO BELOW: Elderly mares brought to concrete fortified stalls in anticipation of Hurricane Irma in SW Miami Dade, FL. While the ultimate effects of Hurricane Irma are unknown, we do know the expenses from this monster storm for SFSPCA will be huge.